I am "supposed" to be finishing my entry into Rambling of Great Khan's Roman adventure contest, but instead I was thinking about how Inquisitors exist on a spectrum, not only of their varying political views, but on how active they are personally, and how that influences the nature of their retinues. Leaving out psykers for now, think about a range, from Gideon to Tyrus, behinds the scenes string puller who relies on a combat team for action, to in your face power armored brute. Each has a range of personal combat power, from the feeble old woman who investigates through books and agents, through power armored chap who burns and punches his way to what he wants. Each of these supplements their skills with a retinue, and probably more interestingly for a tabletop game, augments their personal power with the combat power of the retinue. Not retinue in the sense of all the forces they could muster, because Inquisitor Lords and older inquisitors often have a lot of resources and allies to call on, but retinues in the sense of the core group that an inquisitor would take to meet another inquisitor... or possibly to raid another inquisitor's domicile in a smash and grab raid. In either case, it seems like an inquisitor is trying to reach a certain level of power to bring to bear on a situation, and the physically frail one is going to bring more firepower to compensate for their frailty, and a powerful individual is going to feel more comfortable without bringing an indentured space marine with them. Both are perhapes equally likely to call in powerful allies for expected battles. Psykers confuse things a bit, but you could see it as being part of the same scheme, where powerful individuals need to augment their power less (and perhaps bring more physical operatives), while weaker individuals need to bring out the stronger assistants (such as a psyker pet). In any case, it seems like the "medium" Inquisitors, i.e. those who do some of their own investigations, but are more subtle than the power armored burninators, might actually have the more interesting retinues. They might have some powerful band members, but could also feel comfortable including more savants or researchers of moderate to negligible combat utility. In my own (slow) work, I am working on creating a bit of a range in the power of inquisitors and supporters, but it keeps hovering around the middle, where I think the interest really lies. Related to these musings, I have set up a new Pinterest board that features Inquisitorial Warbands. it is pretty empty now, but I am trying to round up good shots of all the various inquisitors with their retinues. Ever flowing fount of ideas Telecanter has a refined die drop method of village generation for your roleplaying games. Go ahead and read it, I will wait. 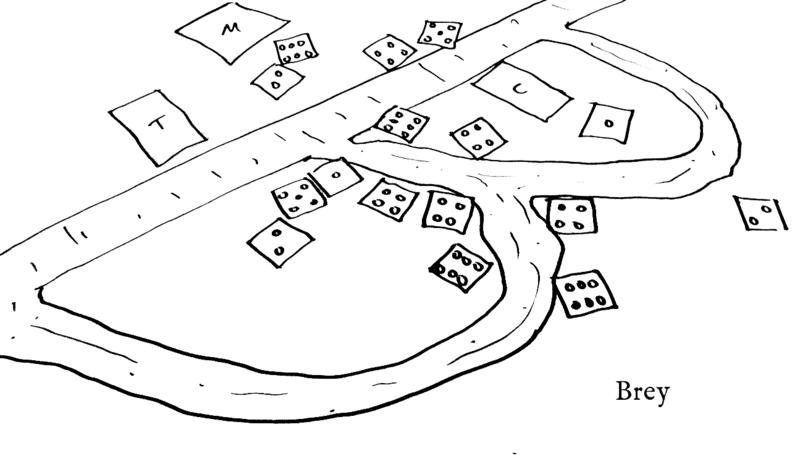 In the comments, I suggest that the DM should decide how many d6 to drop for the village, and then divide that number by four to get the number of d8s dropped, and the number rolled on the d8 is the type of building that it is. So the procedure would be roll letter die to get road/path shape, draw your map, select number of d6 (3-12 say), roll one d4 and number of d6/4 d8s with the d6s. Then record the position of the dice, and the numbers and building types. If you need to have a "special" building, either for a village headman or for the bad guy, just include a die of another color with the d6s. Example: Our letter is T for "Tukesbury", the number of dwellings is 12, so the number of d8s is 3. the DM rolls out 1d4, 12d6, and 3d8. Here is my only completed figure for 2012, an Ork I painted to give to my wife for Christmas. I had good intentions for painting this year, and started out pretty strongly when I was rushing to complete figures for the D&D game that I ran back January... but I barely put brush to figure in the past year, and did not end up finishing anything. This ork, being a gift, had a deadline, and consequently I was forced to hurry it up a bit. I woke up early every day, and stayed up late every night for a week, realized that I was still behind, and started painting at lunch time at work as well. The figure is a conversion of the nob that comes in the ork boys box, and consists of something like 36 parts, and a sculpted hat, so it was a bit fiddly to put together. The peg leg in particular made it hard to balance. My wife hates Eldar, so I got a spare helmet and made a ripped spinal cord for it, and now he stands on it. I painted it with my usual mix of various vintage Citadel paints, and some Vallejo as well, using mostly a 00 liner brush I got for $1 at a craft store. The long bristles were pretty useful in painting in all the freehand work, and allowed me to use thinner paint than I would usually use. The wash was a mix of Citadel black ink, craft paint matte sealer, and Future, and then I painted some of the highlights on top of that. Hopefully the results are worth it. The base still needs a few bits of grass or flock, but it is otherwise complete. 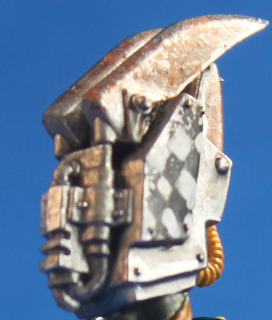 Unfortunately I managed to not get a clear shot of the bit I was most proud of... the flaked rust on his power claw. I have: Two of the old battleforce boxes [each has 3 battle suits, 12 kroot, 12 Tau, 10 drones, and a sprue of jungle trees], 2 more battle suits, 2 broadsides, 2 devil fish, 1 hammer head, and a couple of blisters of kroot hounds. All bought on ebay long ago, for substantial discounts. The funny thing is, that at current prices, just the battle suits alone would cost more than I paid for the battle forces, making the kroot and tau firewarriors "free". ($24.5 each for a total of $73.5, and I paid $50-$60 for my battle forces) For that matter, the current battleforce is $120 US, which is roughly twice as much as I paid for the previous one. 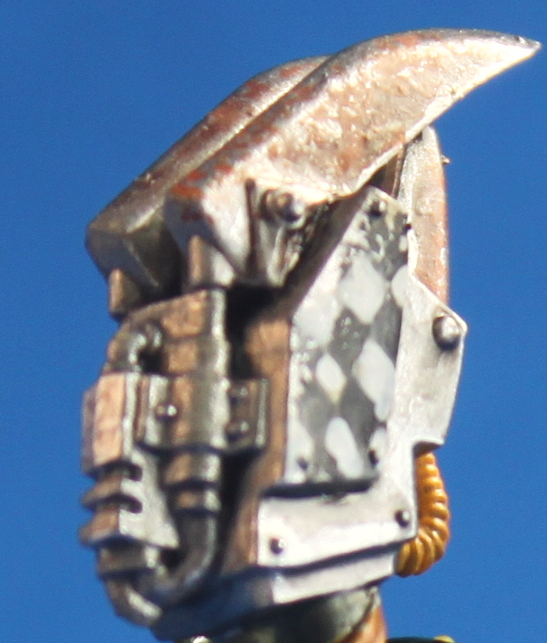 Another interesting aspect of the Tau firewarrior sprue (the basic infantry of the Tau), is that it has 5 sets of legs, 5 heads, 6 guns, but only 4 torsos and shoulder pads. So for the bitz buy of a torso, you can get a whole new figure, provided you are willing to forgo the shoulder pad... which the pathfinders do not have anyway. Since I plan to have this army work for StarGrunt II as well, it makes sense for me to do that, as I want to have a couple of heavy weapons teams and officers, which would not fit into the normal 40k army list. #97 The fellow is carving away at a grotesque stone idol. Arms moving feverishly, he sweats through the grey layer of dust that covers the entire front of his body. Anyway, give it a look, you may find it to be interesting. Some friends of ours were visiting from Philadelphia this weekend, and they gave us a belated Christmas present in the form of a new game: 7 Wonders. First published in 2010, 7 Wonders is a strategy card game, where two to seven players work through three decks of cards (for three "ages") and accumulate played cards in a tableaux which provide some benefits during the game, and victory points at the conclusion. Each player may build an assigned world wonder, which will give either additional victory points or some sort of mechanical bonus, such as resources or free building. We played four games, two with three players, and two with four, depending on the needs for childcare, and had a great time. The game plays fairly quickly, with our games taking around 45 minutes to complete (including the scoring round, which can be complicated!) Players are dealt seven cards, select one to play per turn, and then pass the rest of the cards to the left or right depending on the round. Cards may be paid for with resources, or placed for free depending on their cost section, and then either provide victory points directly, or provide some sort of benefit. As is common in Euro styled games, none of the cards are played "against" the other players, but you do have to keep track of their various bonus schemes and resources as the game progresses. Military cards merely provide military points, and then once per "age" your score is compared to your neighbors and you get victory points if you have a higher score than they do. The game was fun, and fairly fast, and I recommend it. As an added bonus I see that there are currently two expansions (leaders and cities), and another is coming out soon, so should we get tired of the basic set, there are more options out there to keep it fresh. I have long wanted to have a proper games table, fully done up with modular terrain tiles, undulating surfaces, hills, forests, etc. Such a table could be used for many games, and would look lovely during play, which is really the goal. However, lack of time, money, and space have conspired together to prevent this from occurring. 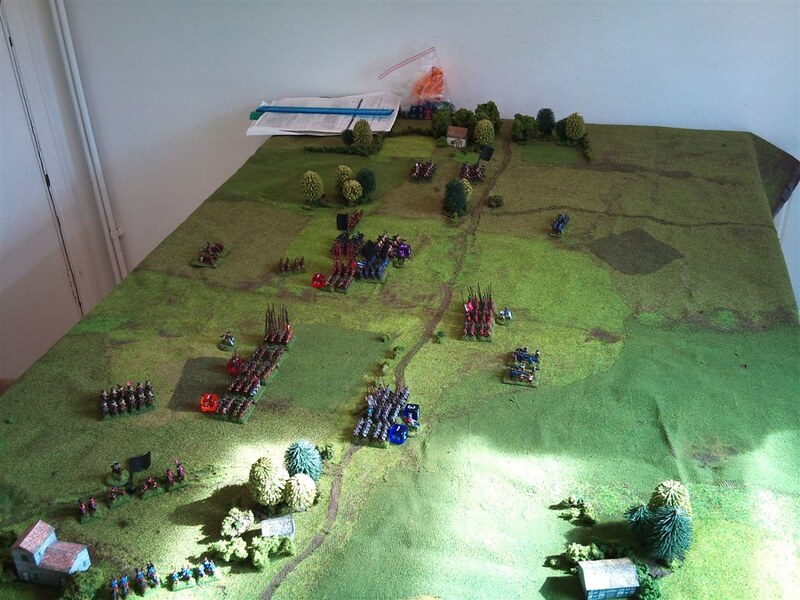 A terrain mat, on the other hand, gives many of the benefits of a bespoke terrain table, and has the advantage of being much cheaper and easier to store (as one simply rolls it up). While it does not have movable components like a modular table, nor does it do integrated hills quite as well, it does have the ability to have items places under it to create terrain contours, which can be good for rolling terrain. There are many manufacturers of terrain mats, ranging from painted felt, as exemplified by Hotz mats, to latex, as exemplified by Zuzzy. Both types are somewhat pricey, however, you certainly get a quality product in the end (and with Hotz you can get a double sided mat for $20-$80 more depending on type and size). Another option is to make your own mat, which of course trades a certain amount of for some (potential) savings in terms of cost. Several times I have seen picture of people using canvas mats covered with acrylic caulk and flock, and they look quite nice, and remain flexible. As an added bonus, you can mount the canvas over rubber foam tiles (like for the floor) and then pin mount trees or other terrain to the board for a more realistic look. In researching for this, I was reading about the Battle of Five Armies (Bo5A being the game I am most likely to get going on this terrain), and while looking at maps of the battlefield, I have decided that it is similar enough to the layout for the Battle of the Hornburg to make the mat work for both with some small adjustment. 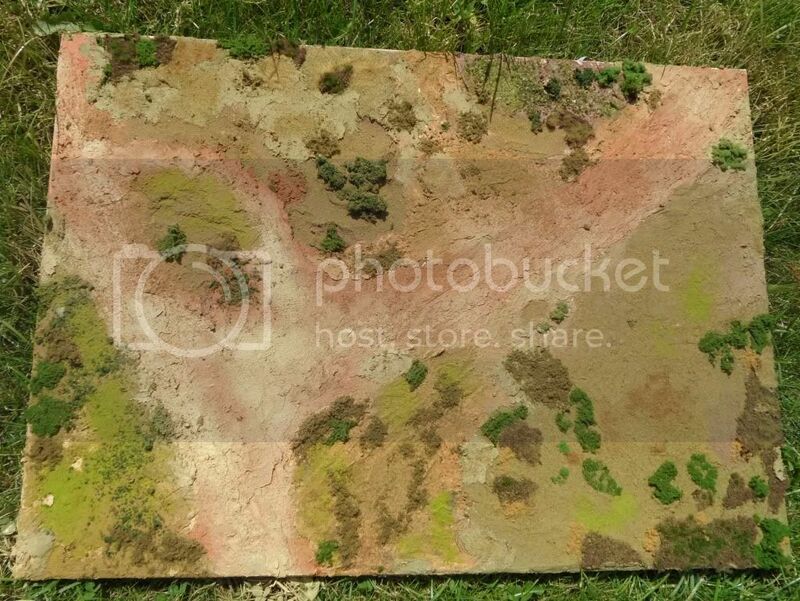 This should also be usable as a generic Dirtside or FoW table as well, as grass and dirt are fairly scale agnostic (and some large scale scatter terrain, trees, or fur fields will help as well for 15mm games).